In 2009, a Norwegian student named Kristoffer Koch bought 5,000 bitcoins for roughly $27 as part of his thesis on encryption technology. He put them in his digital wallet and promptly forgot about them. Four years later, his $27 investment was worth $886,000 – a nearly unimaginable return of more than 38,814 times his initial investment. If Mr. Koch had held all that bitcoin, his $27 investment would have skyrocketed to $81.5 million when Bitcoin hit its peak price. Mr. Koch didn’t keep all of his bitcoins. He sold approximately one-fifth to pay for an apartment in Oslo. But let’s assume that, instead of buying an apartment, he sold one fifth of them to one buyer. That buyer would have turned $886,000 into a stash of bitcoins still worth $3.9 million today – a return of 340% in over 8 years. 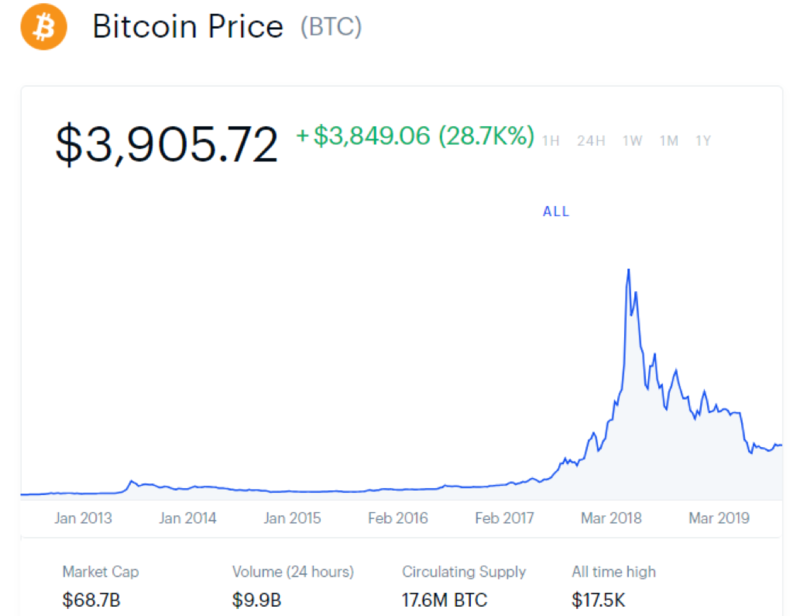 At $3,900 per coin as we write this, bitcoin is still 4 times higher than where it started in 2017 despite a massive decline. It is easy to see why bitcoin has been garnering so much press and been taken seriously by many in the Wall Street establishment. The incredibly rapid appreciation of this crypto-currency gives bitcoin a current market cap of approximately $68.7 billion. Love it or hate it, Bitcoin is serious money. Not surprisingly, Wall Street has been trying to create products to make trading and investing in bitcoin easier. Two attempts by the Winklevoss brothers of Facebook fame – operators of Genesis, one of the biggest online bitcoin exchanges – to launch a bitcoin ETF that allows individual traders to buy bitcoin were shot down by the Securities and Exchange Commission (SEC) in March 2017. Other attempts have met with the same fate. But Wall Street keeps trying. Any successful attempt to create a Bitcoin ETF could send the price of Bitcoin through the roof. Until then, the only way to trade bitcoin outside of individual online exchanges is in the futures market. A decision by the Commodity Futures Trading Commission (CFTC) to classify crypto-currencies as commodities – like gold, silver or crude oil – led to the recent launch of two new futures contracts which allow speculators and hedgers to easily and transparently conduct transactions involving bitcoin. These contracts have a few critical advantages over the electronic exchanges currently used to buy and sell bitcoin, especially when it comes to transactional transparency and counterparty risk. They also have some privacy disadvantages as well. We’ll cover these, as well as attempt to explain what bitcoin is (and isn’t!) in the simplest language possible. An up-to-date version of the chart above can be easily accessed by plugging the phrase “bitcoin price chart” into your favorite search engine. The chart above covers the entire price history of bitcoin going back to 2013. At its initial public launch in 2010, it traded for less than one cent per bitcoin, and then rallied 900% to 8 cents in just five days. Bitcoin was born volatile and remains so. The $3,905.72 price you see on the top of the chart was price during the morning on March 15, 2019. Its’ all-time high was $17,500 per bitcoin in 2017. The “circulating supply” line in the bottom right hand corner of this chart shows that 17.6 million bitcoins have been “mined” and are available as of March 12, 2019. All Bitcoin mining will cease once 21 million bitcoins have been created. This “scarcity” is built into the algorithm. (More later.) Bitcoin bulls often mention this “guaranteed limited supply” when they talk about how high their currency of choice can go. Forecasts of $1 million per bitcoin make this assumption as well. In order to understand how bitcoins are mined, one needs to have a basic knowledge of blockchain technology. To comprehend the basics of blockchain as it relates to bitcoin, it helps to compare it to how we traditionally buy and sell things. We make transactions in three ways: 1) we pay cash; 2) we write checks (or use debit cards), and 3) we use credit cards. The first transaction, a cash exchange, is made between the parties of that transaction and can be completely anonymous. Anonymous transactions are virtually untraceable and, more-often-than not, irreversible. Transactions 2) and 3) require intermediaries. A check requires a bank account. Credit card transactions require at least two banks – one to guarantee the initial transaction and a second to process the payment; in the case of transactions involving foreign currency, it requires a third. Each intermediary collects fees as compensation for their part of the transaction, whether or not that fee is disclosed. Your bank earns interest on the money you’ve deposited. It may also charge you a fee to write a check, and another fee if your account balance dips below a set amount. Credit card companies charge retailers and other businesses fees as high as 3% of every transaction. Some charge credit card holders steep annual fees as well. Today, over two-thirds of transactions rely on plastic. Most of these involve credit cards. To assure these transactions are legitimate, banks and credit card companies (often the same entity) have huge, centralized databases containing critical information about their customers. This information must be kept up-to-date in real time, so they can be shared with other centralized databases to verify transactions. Credit card companies use the fees they charge to maintain these extensive databases and generate a profit. The centralized nature of these databases make them extremely efficient. However, this centralization is vulnerable to hacking and, once hacked, can expose millions of credit card and bank account holders to monetary and identity theft. That’s what happened when the credit rating company Equifax was hacked in 2017 and the Social Security numbers, birth dates and home addresses of up to 143 million Americans – 44% of the US population – were stolen. Stolen personal data is not the only threat. What these companies do with your data, even when they are not hacked, represents a loss of privacy as well. All of your transactions, including what you bought, how much you bought and where you bought it, are up for sale to companies who use that data to market to you. Bitcoin is based on technology known as a “blockchain.” This is essentially a database composed of individual “blocks” of data – or in the case of Bitcoin, blocks of transactions. Each block in the Bitcoin blockchain has a time stamp and is related to the block that comes before it. There are no names, addresses, phone numbers or other personal information associated with Bitcoin transactions. All transactions take place purely in code, which make them completely anonymous. Once a new “block” of Bitcoin transactions is added to the chain, its time stamp and relationship to an earlier block means Bitcoin transactions cannot be easily altered or deleted without altering every subsequent transaction in the chain. Imagine a brick building that is being perpetually constructed as workmen add more and more bricks every day. 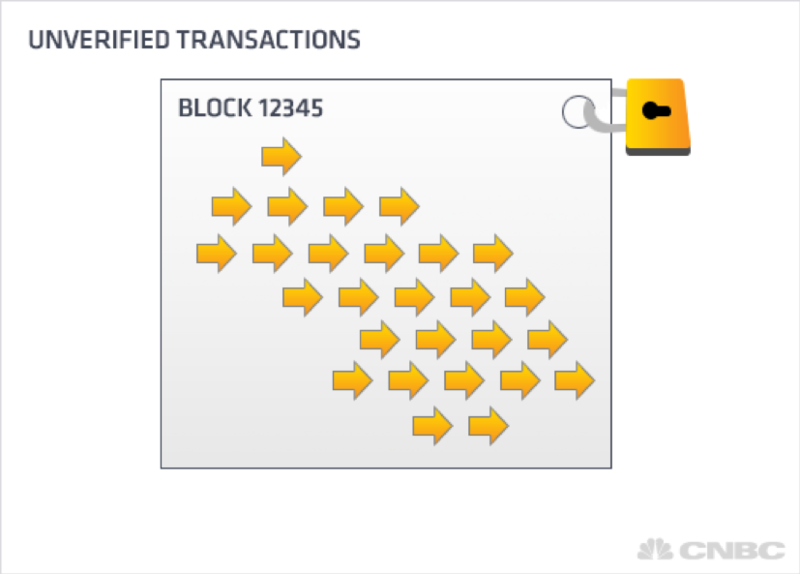 Every single brick (or block) represents an independent transaction. Every brick has a relationship with the bricks directly surrounding it, yet every brick is also an essential part of the whole structure. 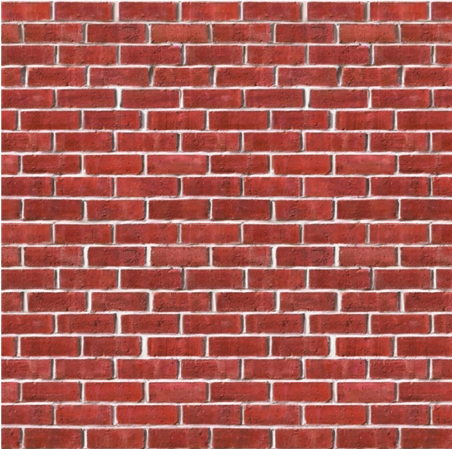 Imagine trying to change or remove a single brick (or block) without knowing where that brick was in the structure or when it was placed there. Now imagine trying to do this without altering the structure as a whole. Any attempt to change any part of the blockchain would be noticed immediately. It would be like removing a single brick from a wall; it would stick out like a gaping hole. While an imperfect analogy, this gives you an idea of how difficult it would be to “hack” the Bitcoin blockchain. The expense and computing power to attempt such a task would be astronomical and uneconomical. This is one of the reasons why the Bitcoin blockchain has never been hacked. The bigger the blockchain, the harder it is to alter any block in the chain, and the more computing power it takes to manage it. This becomes particularly important when it comes to “mining” bitcoin. Like the bricks in our metaphorical building, bitcoin is made up of individual blocks that when viewed together contain the whole encrypted record of every bitcoin transaction ever made. This eliminates the need for a central database and makes bitcoin extremely mobile. The Bitcoin blockchain ledger can reside anywhere or everywhere on the web. It is borderless. Because each block in the chain is only related to a previous block, no one making transactions on the Bitcoin ledger has access to the entire database. Bitcoin users only access those parts of the blockchain they “own” by using private encrypted keys. Private “keys” (basically, unique pieces of encrypted code) allow a user to rewrite only those parts of the Bitcoin ledger that involve themselves and the entities on the other side of the transaction. Bitcoin “keys” are used to access addresses that contain units of currency, which can then be transferred directly to a recipient. Once a private transaction takes place, it is added to the blockchain and becomes part of the ledger, creating an unalterable and undeletable record. This eliminates the need for centralized record-keeping. The same architecture responsible for facilitating the transaction creates and stores the record. Aside from Bitcoin miners who verify the integrity of the transaction, no middlemen are required to ensure its legitimacy. The only parties that can access the details of a specific transaction are the parties involved in that transaction who hold the same encrypted “key.” No names, addresses or other personal data is required. This makes Bitcoin and its other crypto-currency cousins very valuable to those wishing to keep their financial comings and goings on the “down low”. It is why bitcoin gained its initial notoriety on the “dark web” as the preferred means of exchange for drug transactions – a dubious distinction it still holds. There are three ways to obtain bitcoins: 1) accept them as payment for goods and services, 2) buy them on an exchange, or 3) “mine” them by employing energy (in the form of electricity) to generate computing power. Almost 17 million bitcoins have been mined in just the past 7 years. An exponentially-increasing degree of difficulty means the 21 million bitcoin cap is not expected to be hit until the year 2140. Bitcoin acts like cash when it is used in a transaction, but it can also be “mined” like gold. Bitcoin “miners” are paid in bitcoin for their work in verifying the transactions on the Bitcoin blockchain. The mining process consists of compiling recent Bitcoin transactions into “blocks” and trying to solve increasing complex math problems. The first person to “solve” the math puzzle gets to place the next block on the chain and is rewarded with an administrative fee and a “block”of bitcoins. Let’s look at a simple transaction involving bitcoin: Cindy buys a necklace from Susan and pays her with bitcoin. In order to guarantee that Cindy’s bitcoin is real, miners rush to verify her transaction. Whoever does so first, gets bitcoin as a reward. This is a very simple example, but it basically describes what a bitcoin miner does. Why doesn’t everyone with a computer mine bitcoins? Because scarcity and the rapidly-increasing difficulty of mining were built into the algorithm by Bitcoin creator Satoshi Nakamoto (a pseudonym based on a common Japanese name). As mentioned earlier, bitcoin mining will stop at 21 million bitcoins – but that’s not the only limiting factor. Mining bitcoin gets harder with time and computing power. The number of bitcoins paid out to bitcoin miners is halved after new 210,000 “blocks” are added to the blockchain. The bigger the blockchain, the fewer bitcoins a miner is able to claim for his or her increasingly difficult, electricity-sucking work. The ever-increasing size of the Bitcoin blockchain demands more computing power to administer and navigate. Individuals once mined bitcoins using their home computers. Some surreptitiously used malware to infect other unsuspecting computers so they could hijack processing power and create even more. Not anymore. The computing power necessary to create new bitcoin is so massive that a miner without specialized equipment runs the risk of losing money on electricity alone. The Bitcoin blockchain has gotten so large – and the math so complex – that special chips have been designed for the sole purpose of mining bitcoin. As the size of the Bitcoin blockchain grows, the amount of electricity needed to mine bitcoins expands rapidly. Some have estimated that by 2020, all of the world’s energy will be required to mine bitcoin. It costs roughly $5,000 in electricity to mine a single bitcoin right now with relatively cheap power. This cost will continue to climb. However, Bitcoin does meet much of the criteria for a currency: it is scarce; it is easily and infinitely divisible; and it is easily transportable anywhere by anyone connected to the internet. It is this reliance on a connection to the web that is its Achilles heel in our opinion. What happens to the Bitcoin blockchain if an Electro-magnetic Pulse (EMP) attack or series of EMP attacks in a global conflict shut down the internet? Bitcoin enthusiasts point out that the vast majority of the world’s traditional money exists only as a series of ones and zeros and would be vulnerable to the same type of attack. They are right. However, the non-anonymous nature of our current financial database management means that there a number of ways, other than the internet, to prove ownership of money and property – starting with paper statements. The Bitcoin blockchain has rarely been hacked, but plenty of bitcoin exchanges have, resulting in millions in losses. Probably the most famous Bitcoin exchange hack was the one that brought down Mount Gox, the largest Bitcoin exchange at the time of the attack. News of the hack sent the price of bitcoin sharply lower. 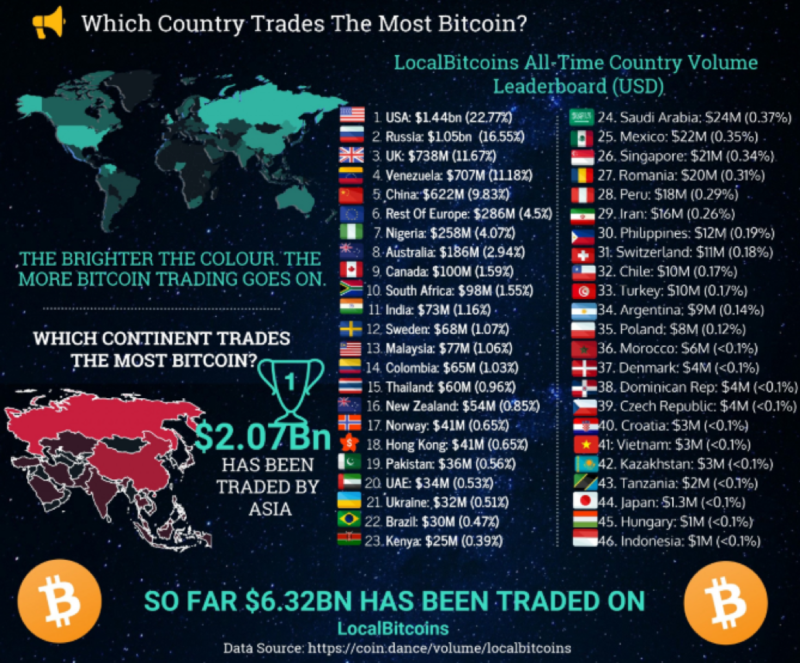 A huge number of bitcoins traded on that exchange, and others have either been stolen or simply disappeared. The anonymous nature of the Bitcoin blockchain also makes most stolen or lost bitcoins nearly impossible to track. The records are there somewhere in the blockchain, but without the proper encryption keys, they are inaccessible. Lose your encryption key and you lose your bitcoin. The answer has to be an unequivocal “yes” – at least so far. An investment in bitcoin has surpassed returns in gold, silver, stocks, bonds and virtually every other traditional investment. Will it continue to do so? Bitcoin is displaying nearly all the signs of a mania – including a “hockey stick” chart pattern. It has also captured the fancy of the mainstream financial media after years of lurking in the netherworld of the dark web. CNBC now posts its dollar value on an almost daily basis. How much longer will the party last? There is no telling. Bitcoin is still too volatile to be used as a practical currency. Since we can’t see it, touch it or experience it in any way, its only function right now – apart from dealings on the dark web – is as a store of value – albeit the most speculative one ever created. Things are ultimately worth what other people will pay for them, whether it’s tulip-bulbs, dot-com stocks or the pieces of computer code we call “bitcoin.” What people will pay is often based on nothing more than the belief that the “thing” (whatever it is) will be worth more at some point in the future. Belief can also be communal and collective. Think about any cash transaction. A cash transaction can only take place if both parties agree that the paper notes being exchanged are worth the amount printed on them. Since modern cash is not backed by gold, silver or any other fixed asset beyond the “good faith and credit” of the government issuing it, cash transactions are, in effect, based solely on collective belief. The only thing that makes a $100 bill worth $100 is the shared belief that $100 is what it is worth. There is really nothing else behind it. The same goes for gold, art, collectibles or any other non-income producing asset. Bottom Line: Enough people believe in bitcoin right now to give it a current market capitalization of nearly $68.7 billion. That means these pieces of computer code based on “nothing” are definitely worth something – at least for the time being. China made up the lion’s share of Bitcoin trading until the Chinese government clamped down in November by banning all commercial trading of Bitcoin. This did not stop the bull market. The action just moved elsewhere. By the end of November 2017, 80% of global Bitcoin trading occurred in Japan, South Korea and Vietnam. Since then, South Korea made moves to limit Bitcoin trading while Japan accepted it as legal tender. Not surprisingly, the bulk of Bitcoin trading on electronic exchanges moved to Japan. Now trading is spread throughout the globe. The popularity of bitcoin in Asia makes sense. 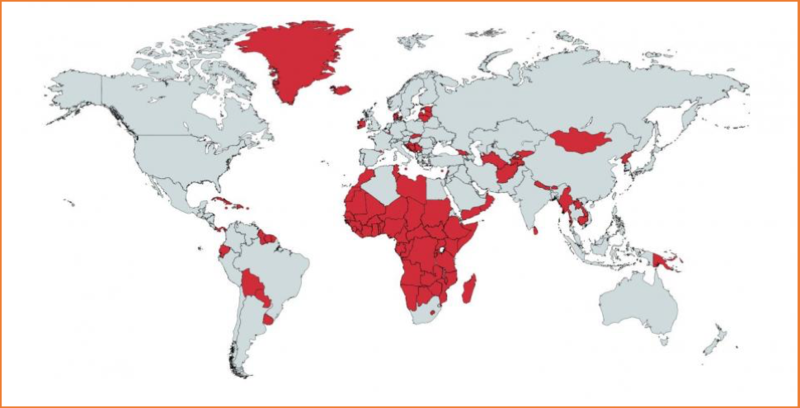 These nations have a history of governmental meddling, including currency controls, market manipulation and outright confiscation. Asia is not the only place Bitcoin is exploding. Bitcoin is becoming a big hit in countries that face currency troubles, including Africa, Russia and Venezuela. The number of new Bitcoin traders in South Africa rose 671% in the first 11 months of last year. Individuals looking to protect themselves have historically turned to other stores of value like gold – or copper in the case of China. But these “hard money” alternatives have disadvantages. They are not easy to transport and, because they are vulnerable to theft, must be stored in secure places. It costs money to store and transport physical gold and silver. Both metals can also be confiscated. It costs nothing to store or transport bitcoin anywhere in the world with an internet connection, and to do so anonymously. Bitcoin can be converted into any major sovereign currency quickly and easily without a middleman. This makes it a preferred choice for Asians and anyone else who wants to move money from one country to another without being noticed. Unlike metals, bitcoin cannot be confiscated. Some are blaming Bitcoin for the lackluster price action in gold and silver that has dominated the past three years of trading, despite a shrinking US dollar, rising global tensions and the very real possibility of war on the Korean peninsula. If the success of Bitcoin is coming at the expense of gold and silver, then investors may want to take a look at long positions in both metals as a way to play the potential for a meltdown in the world’s most popular crypto-currency. Bitcoin’s future as both a store of value and as a legitimate currency ultimately rests with the generation most comfortable with the internet. Millennials grew up with technology. Many have embraced automatic, algorithmic investing – leaving it up to computer programs to decide where and when their savings are invested. It is no surprise that they have embraced Bitcoin as well. 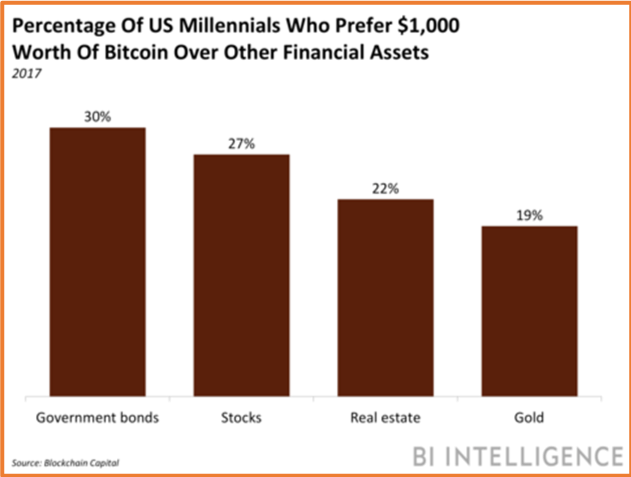 Thirty percent of Millennials prefer Bitcoin over bonds, 27% over stocks and 22% over real estate. Only 19% prefer Bitcoin over gold. The Midas metal is not giving up its reputation as a store of value any time soon, despite being upstaged by Bitcoin and other crypto-currencies right now. Bitcoin founder Satoshi Nakamoto created the very first bitcoins in 2009 as a direct response to the 2008 global financial collapse – a catastrophe aided and abetted by the rampant greed embedded in the banking system. He (or she, or them) wanted to create a currency which could be traded peer-to-peer and circumvent corporations, bankers and governments. While the Bitcoin blockchain accomplishes that, the complexity of blockchain technology coupled with its rapid growth have attracted a whole bunch of middlemen, starting with Bitcoin exchanges. Because Bitcoin is too intimidating for non-technical participants, the vast majority of it is traded on a large number of different electronic exchanges, each of which exists to make the transfer of bitcoins between buyers and sellers easier. Exchange participants must have a digital “wallet” that can accept as well as dispense bitcoin. Like nearly all exchanges, bitcoin exchanges make money by either charging fees or making a market and collecting the difference between the “bid” and “ask” price of the bitcoins traded on the exchange. Traders are expected to “settle up” with the exchange in real time in dollars, yen or whatever currency is used to price Bitcoin on that electronic exchange. Failure of any large exchange participant to settle up, caused by unexpected volatility or a service crash, can negatively impact the viability of the exchange itself and result in losses by exchange participants. Volatility can also wreak havoc with the smooth functioning of an electronic Bitcoin exchange. It hinders the ability of participants to exit or enter positions especially when bid / ask spreads widen precipitously. Many exchanges – even some of the larger, respected ones – will simply stop trading rather than assume the risk of standing on the other side of a transaction that could result in a loss due to volatility. This situation could make it impossible for exchange participants to enter or exit a position. Electronic exchanges and digital wallets are designed to interact with the Bitcoin blockchain, but they are not part of it. Like any centralized database, they are vulnerable to hackers. The anonymous nature of the Bitcoin blockchain makes bitcoin lost or stolen as a result of a hack virtually impossible to trace or recover. Hacking has always been, and will probably continue to be, a problem for speculators and investors using electronic exchanges to buy and sell Bitcoin. Futures contracts are a potentially “safer” way to speculate on Bitcoin. Unlike the electronic exchanges currently in use, Bitcoin futures are traded on exchanges made up of clearing corporations. Modern clearing corporations guarantee the integrity of each and every transaction, becoming the de-facto buyer to all sellers and seller to all buyers. They eliminate nearly all counterparty risk. Futures contracts are transparent. All futures transactions have real-time tracking and are easily traceable. Money may be lost through trading, but it won’t disappear due to a hack. While this does involve the loss of the anonymity provided by the blockchain, it also means greater transparency. Futures contracts are extremely liquid and trades are instantly verifiable. This makes trading relatively friction-fee compared to electronic exchanges. The growing size of the Bitcoin blockchain means it can take hours and lots of computing power to verify transactions. Bitcoin holders can use the futures market to “exit” the market instantaneously. Bitcoin bulls can use futures to establish long positions instantaneously. There is no lag. More importantly, futures exchanges are well-accustomed to volatility and rarely shut down or stop trading because of it. Futures contracts provide a way to “short” bitcoin. There really hasn’t been a good way to “short” Bitcoin until now, aside from a few, fairly illiquid electronic option exchanges. The anonymous structure of the blockchain makes it impossible to “borrow” bitcoins and sell them to someone else with the intention of buying them back for a lower price later. Since Bitcoin futures are tied to the price of Bitcoin and not to physical Bitcoin itself, it is just as easy to “sell” (or “short”) contracts as it is to buy them. By providing a method to “short” bitcoin, futures contracts can also lead to faster overall acceptance of bitcoin as a legitimate currency. Futures contracts can help make bitcoin more acceptable as payment. Vendors may be quicker to accept bitcoin as payment if they could lock in the value of bitcoin by shorting futures to hedge its value. Larger players may be more willing to part with bitcoin in exchange for goods or services if they knew they could still participate in upside appreciation by buying futures contracts. Futures contracts are essentially “paper transactions” – they do not involve the purchase and sale of the actual investment instruments themselves. They are contracts for delivery at a future date. Because no delivery takes place prior to a specified period, no money actually changes hands. The buyer of a futures contract does not have to pay money and the seller of a contract does not receive any money. Rather, both the buyer and the seller must post margin with their respective brokers. Margin requirements are set by the individual exchanges and, for the most part, are based upon volatility and not price. Unlike stocks, the treatment of long and short futures contract positions is identical. Unlike a short seller in stocks, the seller of a futures contract does not need to “borrow” his contract from another party—making it just as easy to sell as to buy. Unlike stock margin, margin to trade a futures contract is not a down payment on a loan. It is a performance bond that guarantees your broker and the clearing corporation that you are good for a fixed amount of losses. The incredible volatility of Bitcoin trading means bitcoin futures have high margins. Futures margins for being short bitcoin are higher because losses on the long side are capped (bitcoin can’t drop below zero) while losses on the short side are theoretically unlimited. No one knows how high bitcoin can go – especially if it is eventually accepted as a legitimate currency. As we mentioned earlier in this report, some forecasters are predicting the price of bitcoin to rally as high as $1 million each. Cboe (Chicago Board Options Exchange):Contract size equals 1 bitcoin. Price is based on the Gemini Exchange – currently the largest US-based Electronic Bitcoin exchange. Price is in US dollars. CME (Chicago Mercantile Exchange): Contract size equals 5 bitcoins. Price is based on the Bitcoin Reference Rate (BRR) which consists of pricing data supplied by several different exchanges and platforms including Bitstamp, GDAX, Itbit and Kracken. Price is in US dollars. Both of these contracts have been trading since November 2017 with the smaller Cboe contract trading a few weeks longer. Because of its small size, the Cboe contract appears to be attracting more individual traders and more volume. This could change if the larger CME contract begins to attract more institutional capital. The investing world hasn’t seen anything quite like Bitcoin. Its amorphous nature makes it hard to price. Bitcoin may ultimately be worth nothing at all, but it is also possible that it may eventually be worth much more. It is perhaps the purest speculative vehicle we’ve ever seen. Its incredible volatility makes it well-suited for short term trading. If you believe that Bitcoin is just the latest “tulip bulb” or “dot com” bubble waiting to burst, then you definitely want to consider “shorting” it. However, Bitcoin is so volatile right now that the only direct short we see anyone attempting would be limited to the smaller CBOE futures contract. Tight risk management is essential. This would include a series of well managed short-term holding periods rather than a long-term short that could expose one to huge overnight rallies. The eventual addition of Bitcoin put options to the futures contracts will make shorting Bitcoin safer – eliminating the unlimited loss potential in the futures. A “Safer” Way to Short Bitcoin? Bitcoin is displaying all the signs of a classic mania, so it is no surprise that 96% of financial advisors expect it to crash and burn. But the fact that nearly everyone believes Bitcoin is doomed means it may not be. A characteristic of all manias is the tendency of prices to explode higher-than-expected, faster-than-expected. The internet tends to exaggerate this tendency. The famous John Maynard Keynes quote, “The market can stay irrational longer than you can stay solvent” certainly applies here. If, as we suspect, Bitcoin has become the preferred alternative to gold as a store of value (especially in Asia), then perhaps one way to “short” it long term would be to do so indirectly by establishing a long position in gold and/or silver. A collapse of Bitcoin could cause the flood of cash flowing out of the crypto-currency to rush into precious metals. This would make long-dated call options in both gold and silver not only a potentially powerful, indirect “short” for Bitcoin bears, but an effective hedge for Bitcoin bulls as well. The eventual addition of Bitcoin Cboe and/or CME put options to the futures contracts will make shorting bitcoin safer – eliminating the unlimited loss potential in the futures. Unfortunately, they are not available yet. A Better Way to “Buy” Bitcoin? Bitcoin’s potentially unlimited upside means it is starting to find a place in the asset mix of diversified portfolios. Bitcoin’s ability to produce mind-boggling gains means it has the potential to add a lot of “Alpha” (performance above and beyond underlying averages) to a portfolio without adding a whole lot of risk. Assume you purchased 1 bitcoin for $1,000 at the beginning of 2017 and sold it for the $15,767 referenced in the chart at the beginning of this report, pocketing $14,767 in the process. If you bought just one bitcoin for every $100,000 in your portfolio, you would have enhanced its 12-month return by 14.77% for a risk of just 1%. If you bought one for every $500,000 in your portfolio, you would have enhanced your return by nearly 3% for a risk of just 0.2%. That, folks, is some serious (and seriously cheap) Alpha. Bitcoin is trading below the cost of production as we write this. Currently priced at $3,900, each bitcoin costs roughly $1,100 less the than $5,000 worth of electricity it costs to mine it. If Bitcoin is for real, now is probably a good time to buy. The introduction of futures contracts has made it easier for anyone to add bitcoin to their portfolios without digital wallets or encryption keys. Pairing a long position in the smaller Bitcoin futures contract – with a long-dated silver or gold option – could be an effective way of achieving a fair amount of hedged Alpha with a fixed, identifiable risk. The brokers and traders here at RMB Group will be monitoring opportunities in all of these markets as the year unfolds. We will alert our trading customers if and when we see them. Please be advised that you need a futures account to trade the recommendations in this report. The RMB Group has been helping their customers trade futures and options since 1984 and are very familiar with the strategies suggested in this report. Call us toll-free at 800-345-7026 or 312-373-4970 direct to learn more. We’ll send you everything you need to get started. You can also visit www.rmbgroup.com to open an account online. 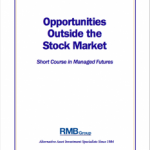 If you are new to futures and options and want to learn more about them, download the RMB Short Course in Futures and Options. This free, easy-to-read guide covers all the basics. Call us toll-free for your free copy or go to our website at www.rmbgroup.com. Click the “Education Tools” tab at the top of the home page and scroll down to find the report.